Nicaragua Travel tours, this is one of the most popular day tours to Nicaragua. A perfect addition to your vacation in Costa Rica as you will see some of the highlights of another beautiful country. The tour starts early in the morning with pick up from hotels in Guanacaste, to make most of the day. You will have the opportunity to visit Granada. Indeed a beautiful city in the country of Nicaragua. As well as walk on the edge of an active volcano. Finish off the tour by doing some local shopping before returning to Costa Rica. 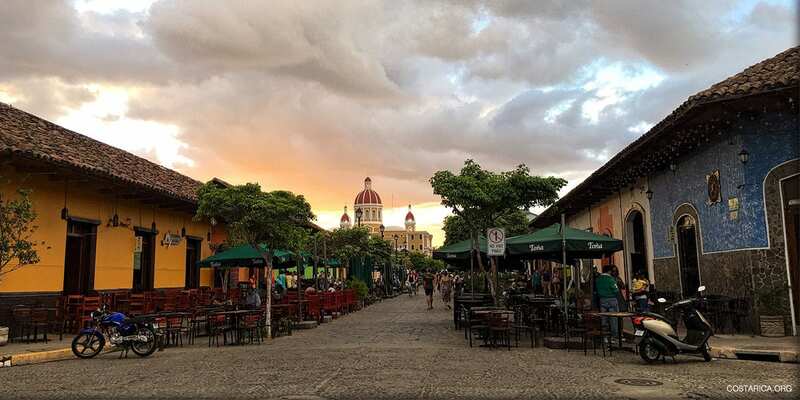 Granada considered one of the most beautiful and historically interesting destinations in Nicaragua. The city was founded in 1524 and has a colorful history. Over the years, it has been held hostage by pirates, bombarded during civil wars. Also, set on fire by the despotic American privateer William Walker. You will have the opportunity to tour Granada and admire its colonial and historical landmarks and its beautiful architecture. The city is lively and friendly, with nice shops, cafes, restaurants and bars to explore and sample local delicacies. In the afternoon of the Nicaragua Day Tour, you will visit Masaya Volcano National Park. The grounds of this national park include the basaltic volcano itself, an interpretation museum exploring the park’s natural phenomena, and the famous Santiago crater. You will also have time to do some shopping at the Masaya Market. There you can look for wonderful Nicaragua souvenirs before returning to Costa Rica.